I was explaining to a girlfriend this afternoon that I am itching to do a DIY/Home project. I know our bathroom renovation is off the list for a while (tears were shed writing that sentence) and I’m pretty happy with Ava’s bedroom and playroom.. so.. the next item on the list is our bedroom. I am so embarrassed to even show you a picture as it is so plain. I have nothing on the walls except a cardboard deer head and our bed is so large we actually have floating bedside tables (we have a king sized bed in a room suitable for a queen). Oh, and one of those bedside tables was broken a few months ago so it’s currently propped up by books and an empty plant stand… yes.. it’s as ridiculous as it sounds. Funny side story- If I record any insta stories in our room I have to purposely make sure I never film near our door so the public never sees my broken side table.. haha.. My dad is a carpenter and we have literally put up with this broken side table for MONTHS.. like more months than I can remember so that’s super awkward and sad..
Anyways.. considering we feel insanely blessed to even have a home I put together an inspiration board that isn’t going to cost a fortune. I’m talking artificial plants and a floating shelf. I kind of love the idea! I felt like I needed to do a roundup of artificial plants as well as there is no way I am putting real plants in our room- bugs, having to replace them every month.. it’s not happening. All of the below are less than $30 each. Some are as cheap as $4.95! When Greg and I first bought our townhouse we knew we needed to cosmetically update the house- I’m talking brown walls, ceiling fans, brown tiles.. the whole lot.. Apparently the lady who lived in our house prior to us purchasing was a police officer so my guess is that she didn’t spend much time at home.. The number one priority on our renovation list though was our bathroom. I’m not sure why I use the word “was” because it’s still on this invisible list. I was promised a bathroom renovation from my husband 3 years ago.. I am still waiting.. I need Bryan from ‘Leave it to Bryan’ to come to our house.. that’s the only way I can foresee our bathroom being renovated.. anyways.. next on the list was our bedroom. We fixed the paint colour, ceiling lights etc but now we have a very plain, simple room. It’s functional so no issues, but there really isn’t any life in it. I’m torn between wanting to paint a royal blue feature wall and keeping the white walls. 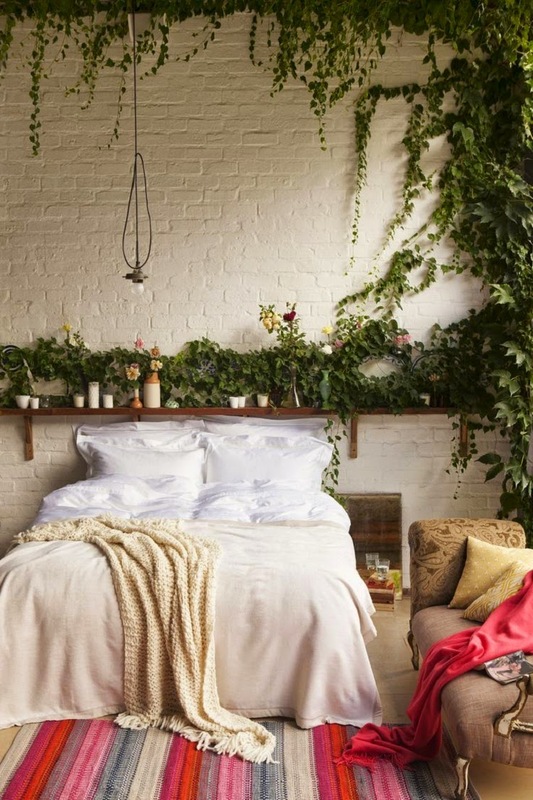 The below two feature walls are from Rebecca Judd loves and Apartment Therapy. 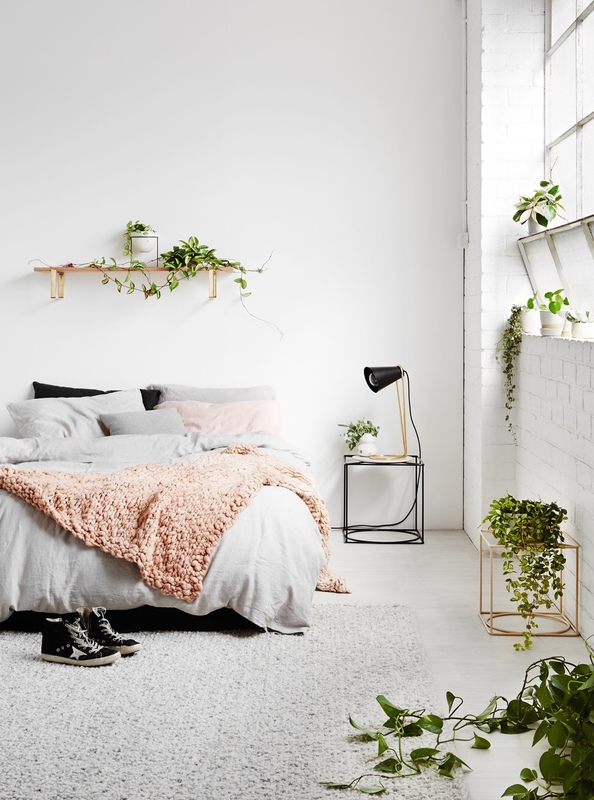 Below is my bedroom inspiration if we kept the white walls and went down the Scandi(ish) road..